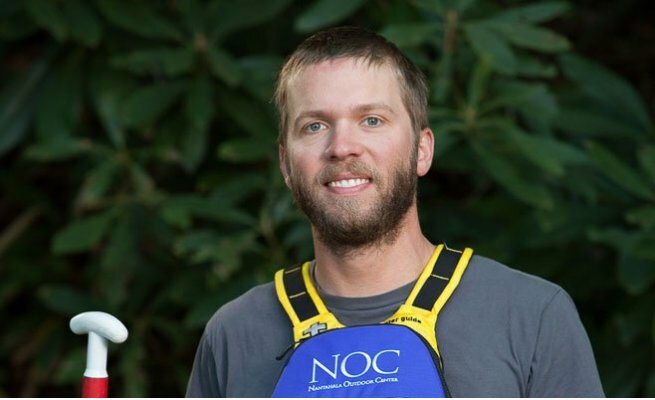 With 15 years of whitewater experience, Russell is an integral part of NOC's Chattooga River Outpost. Russell works mainly on the Chattooga River as a trip leader, kayak guide, guide trainer, photographer – he does it all! He loves the river community, but also really enjoys beating other river companies at the weekly volleyball games. He spends his down time near the river either fishing, kayaking or fishing from a kayak. When he wants to stay dry you can find him going on bike rides with his canine companion, Swamp Fox. Russell is also a certified teacher. With a B.S. in Biosystems Engineering from Clemson and M.A.T. Mathematics from University of South Carolina, Russell is an academic with an outdoorsy side. We are glad he takes a break from teaching high school engineering to come guide with us every summer!